A well-run troop is run by the scouts themselves. While adult leaders are required to oversee the organization, it is the scouts who execute the program. The scouts run each weekly meeting, choose their campouts, community service projects and more. The top three ranks in scouting (Eagle, Life and Star) are generally teaching ranks. 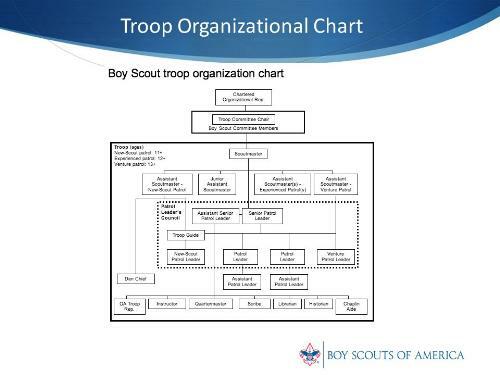 The other ranks (Scout, Tenderfoot, Second Class and First Class) are generally the learning ranks where those scouts learn the program from the teaching rank scouts. The scouts follow a well-organized rank system headed up by the Senior Patrol Leader. The SPL has the Assistant Senior Patrol Leader to help run the troop and the troop's patrols. Each patrol has a Patrol Leader. The troop and its patrols also have other positions of responsibility including Troop Guide, Scribe, Den Chief, Quartermaster, Librarian, Historian, Chaplain Aide, etc. Each of these responsibilities help to build each scout's leadership qualities.